1) The physical benefit - better blood circulation, improved immune system, heart health, improved sleep and a reduction of the stress hormone Cortisol. "Exercising outside exposes you to daylight," explains Professor Jim Horne from Loughborough University's Sleep Research Centre. "This helps get your circadian rhythm back in sync, and also rids your body of Cortisol, the stress hormone that can prevent deep, regenerative sleep." 2) The fitness benefit - Cardiovascular endurance, total body strength endurance - especially in the calves, quadriceps, hamstrings and gluteals (buttocks)! A shift towards a preference as fat for fuel which means enhanced fat burning, plus improved balance and coordination. 3) The wellbeing factor - the fresh air and subsequent neurotransmitter release, as a result of cycling, is great for mood, increasing that feel good, happy feeling. The element of freedom and escapism also helps reduce physiological tension that occurs from psychological stress. 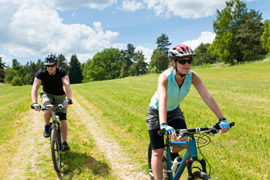 5) The family element - The versatility of cycling means it is versatile to all ages and abilities, so you can have quality time with a partner (some couples make one or two riding 'dates' every week), socialise with friends or make a day of it with all the family. If your kids see you riding regularly, they will think it's normal and will want to follow your example in the future. 6) Transferred benefits to other sports - Whether you want to keep in physical condition/fitness or just improve your weekly tennis or golf game, time spent in the saddle is a great support mechanism. It enhances aerobic capacity in a non-impact way and will compliment other exercise to prevent overuse syndromes due to one-track ways of training. The non-impact element can also be particularly good when you are recovering from an injury. 7) Guilt-free snacking - The calorie output from cycling is significant and due to the normal loss of salt through sweating during a ride it is useful (even encouraged) that you consume salty foods (such as salty popcorn or crisps). This is to avoid a condition called hyponatraemia, a condition caused by drinking too much water without enough sodium (salt) that can lead to disorientation, illness and worse. 8) Energy enhancement - Feeling sluggish? A study published in the journal Psychotherapy and Psychosomatics found that bike riding improved energy levels by 20% and decreased fatigue by 65%. Why? Cycling triggers your brain to release the neurotransmitter dopamine, which is linked to energy, says lead author Patrick O'Connor, Ph.D., a professor of kinesiology at the University of Georgia at Athens. 9) Boost your bowels - exercising decreases the time it takes food to move through the large intestine, limiting the amount of water absorbed back into the body meaning more passable waste (more regular pooing!) plus the acceleration of the breathing and heart rate stimulates contraction of the intestinal muscles which supports the prevention of bowel cancer. 10) Increase your brain power - Researchers from Illinois University found that a 5% improvement in cardio-respiratory fitness from cycling led to an improvement of up to 15% in mental tests. That's because cycling boosts blood flow and oxygen to the brain which helps build new brain cells in the hippocampus - the region responsible for memory, (which is useful given that it deteriorates from the age of 30). This supports the recent research that highlights exercise for warding off Alzheimers through the firing and regenerating of brain receptors!